There's a way to opt out of at least some of the location, gender and age-based ad-targeting that is coming tot those using for free Microsoft's Skype for Windows. 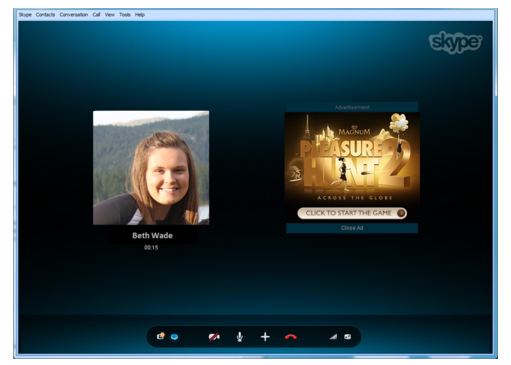 New display ads are coming to Skype for Windows. Called "Conversation Ads," the new ads will appear in calling windows of users who are using Skype Audio (not Video) for free -- in other words, who haven't paid for Skype Credit or subscriptions. "While on a 1:1 audio call, users will see content that could spark additional topics of conversation that are relevant to Skype users and highlight unique and local brand experiences. So, you should think of Conversation Ads as a way for Skype to generate fun interactivity between your circle of friends and family and the brands you care about." The fine print notes that Skype is using "non-personally identifiable demographic information" like location, gender and age, to deliver targeted ads. In other words, The Skype team seemingly isn't listening to your conversation about where to go for dinner and sending you ads for a vegan burger joint near you. The good news for those who don't find targeted ads something that spurs fun conversations among them and their cohorts: Skype for Windows users can opt out of allowing Skype to use at least some of this information. Go to the Privacy menu in Tools and choose "Options" in Skype for Windows. "If the user opts-out, they will still receive advertisements relevant to their location, but Skype will not use other demographic information for this purpose. To opt-out of the use of non-personally identifiable information by our Ad Serving Partners for the purpose of serving advertisements of greater interest to you please visit Microsoft Advertising at http://choice.live.com/advertisementchoice. Or you can visit the websites of the Network Advertising Initiative or the Digital Advertising Alliance, each of which provides a simple way to opt-out of ad targeting from participating companies." Microsoft is allowing advertisers to buy ads in 55 markets. Microsoft officials hinted last year that it wouldn't be long before the company began attempting to monetize Skype. One suggestion was to charge for Skype video archiving and authentication.